The Bluetooth 4.0 USB Micro Adapter from Iogear offers Bluetooth connectivity at a fraction of the size of normal Bluetooth USB adapters. 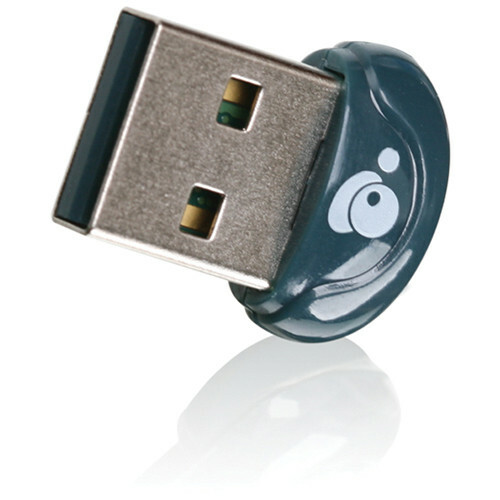 You can plug the Adapter into your computer and exchange images, music, files and other data between your Bluetooth device and the computer. It allows you to connect to all the latest Bluetooth devices like cell phones, headsets, computers, PDAs, mice, keyboards, printers and more. The Adapter being small in size easily plugs into your computer without blocking any surrounding USB ports. The Micro Adapter enables you to connect up to three Bluetooth devices together and transfer even the largest files quickly and easily. With its low power consumption you can enjoy longer battery life on your notebook computer and other devices. This Bluetooth Class 2 adapter is compatible with PC computers and offers a wireless range of 30' (10 m). It is great for a wide range of applications and smaller form factor devices in the healthcare, fitness, security and home entertainment industries. Note: *The included CD is a minisize disket and is not recommended to be inserted into the slot-loading CD ROM drive to avoid damaging the drive. Box Dimensions (LxWxH) 6.3 x 4.4 x 0.6"
Bluetooth 4.0 USB Micro Adapter is rated 4.3 out of 5 by 39. Rated 4 out of 5 by arr2036 from Works great with OSX Needed this for a remote console setup involving two 27 monitors, and optical thunderbolt cable, and a Mac Pro. The thunderbolt monitors don't include a bluetooth radio, so I needed something else. This dongle uses a chipset (BCM20702A0) supported by the kexts that ship with Yosemite, so just works out of the box. Minor annoyance is that you have to reselect the controller on reboot (Using Bluetooth Explorer), but i'm sure this could be scripted, just hasn't got annoying enough yet to fix. Seems to work considerably better than the internal bluetooth radio when used with my Mac Book Pro. No Yosemite mouse lag. Rated 5 out of 5 by Raybot 1 from Very Good Bletooth Device My laoptop was not Bluetoth enabled so I purchased thid device.It comes with the deice (tiny) installation disc and instructione. If you nhave Bletooth drivers in yor'puter that do not work, uninstall them befor running the new disk. Once mine was up and ruunning, I could easily pair it with my smartphone, speaker or any other Bluetoth enebled deice, providing I hsd the passwords. Mainly, I set up a playlist on my laptop, turn it on power saver or medium and put it and the attached USB Bluetooth in my baqckpack. Now I can comfortably walk down the street, subway or anywhere listening to my music on my speaker. Rated 1 out of 5 by Charles B. from would not recommend to start, the plug is difficult to actually insert or remove. It is a super tight fit in all the USB ports i tried, and a couple times even required pliers to get a good enough grip to remove it. but that was the least of the issues. The main issue is that it was not at all reliable. It would drop the connection several times a day, sometimes requiring a system reboot in order to get it to work again, which can be difficult if your keyboard and mouse are bluetooth since you'll no longer be able to use them. I kept trying to get it to work properly for 2 weeks until eventually i gave up and asked B&H for a refund. Of course they happy to do so, which is why I love this shop. Rated 5 out of 5 by Rormeister from Excellent little adapter...except This little product does exactly what it is described to do. However, if you also have a Logitech unifying USB adapter they may collide. My wireless trackball pointer goes totally berserk if both adapters are present and connected. Otherwise, it recognizes all my bluetooth devices including what I purchased it for, my Sony wireless headphones. Rated 5 out of 5 by BjR - Artist from Bluetooth 4.0 USB Micro Adapter by IOGEAR I am not a techie person. This is my first experience with using a dongle. Needed to purchase because it is the only way I can get my photos taken on my phone camera transferred to my computer. Plugged it into the hub I had just purchased and my computer recognized it. Followed the directions and I was able to transfer photos to my computer. I'm happy with it. Since this is the only item I've used it for I can't comment on the other uses. Please refer to manufacturer statement for other uses. Rated 5 out of 5 by Glockmore from This thing really works In my office I am in charge of our music entertainment. I have a Bluetooth speaker that sets 20 or so feet from my desk. My main machine is a desktop system so it did not come with Bluetooth. This is the third Bluetooth adapter I have tried. The music would get choppy at times and break up if anyone walked between my computer and the speaker. With this IOGEAR adapter I have not even had so much as a hiccup through the speaker. This is hands down the best adapter I have used so far. does the GBU521 have windows 10 drivers? my TV has a USB port, can I use this and stream to bluetooth headphones? I have not tried, so I can't say for sure, but this dongle requires Bluetooth software on the device it is put into in order to run. I would have to say no, unfortunately. IOGEAR SAYS: Thank you for choosing IOGEAR. Most Macs already have internal Bluetooth so this would not work. This is listed as PC only. To better service you and understand your set up, please feel to contact our customer support at 1-866-946-4327 or email us: support@iogear.com. Once again, thank you for choosing IOGEAR. Have the Startech version, which works BUT after every restart have to turn off bluetooth, reinsert dongle then turn on bluetooth again. Using with mid 2010 Mac Pro running Sierra. Will the Iogear version stay connected after restarts? Thank you for choosing IOGEAR. There is no guarantee with a MAC using the GBU521. To better service you and understand your set up, please feel to contact our customer support at 1-866-946-4327 or email us: support@iogear.com. Once again, thank you for choosing IOGEAR.